The Tampa Bay Rays head to Fenway Park on Saturday, September 9, 2017 to take on the Boston Red Sox. The expected starting pitchers are Matt Andriese for the Rays and Chris Sale for the Red Sox. The odds for this matchup have Tampa Bay at +241 and Boston at -264. The Rays have a 70-68-3 over/under mark and a 68-73-0 run line record. The Red Sox are 72-68-0 against the run line and have a 60-74-6 over/under record. The Rays have a 70-71 overall record this season. Starting pitcher Matt Andriese has a 5-2 record with an earned run average of 3.78 and a WHIP of 1.29. He has 60 strikeouts over his 69 innings pitched and he's given up 66 hits. He allows 8.6 hits per 9 innings and he has a FIP of 4.79. The bullpen has an earned run average of 4.02 and they have given up 403 base hits on the year. Teams are hitting .232 against the bullpen and they've struck out 413 hitters and walked 174 batters. As a team, Tampa Bay allows 8.2 hits per nine innings while striking out 8.2 batters per nine innings. They are 8th in the league in team earned run average at 4.04. The Rays pitchers collectively have given up 1,150 base hits and 564 earned runs. They have allowed 174 home runs this season, ranking them 14th in the league. Tampa Bay as a pitching staff has walked 439 batters and struck out 1,150. They have walked 3.1 men per 9 innings while striking out 8.2 per 9. They have a team WHIP of 1.27 and their FIP as a unit is 4.26. As a team Tampa Bay is hitting .246, good for 25th in the league. 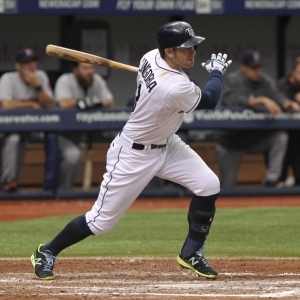 The Rays hold a .428 team slugging percentage and an on-base percentage of .318, which is good for 21st in baseball. They rank 25th in MLB with 8.3 hits per game. Logan Morrison is hitting .252 with an on-base percentage of .353. He has 115 hits this season in 456 at bats with 82 runs batted in. He has a slugging percentage of .537 and an OPS+ of 138. Corey Dickerson is hitting .284 this year and he has an on-base percentage of .330. He has totaled 151 hits and he has driven in 60 men in 531 at bats. His OPS+ is 123 while his slugging percentage is at .507. The Rays have 1,174 hits, including 206 doubles and 201 home runs. Tampa Bay has walked 481 times so far this season and they have struck out 1,343 times as a unit. They have left 972 men on base and have a team OPS of .746. They score 4.35 runs per contest and have scored a total of 613 runs this year. Boston has a 79-61 overall mark this year. With an earned run average of 2.85, Chris Sale has a 15-7 record and a 0.94 WHIP. He has 270 strikeouts over the 189.2 innings he's pitched. He's also given up 141 hits. He allows 6.7 hits per nine innings and his FIP stands at 2.2. The bullpen has an earned run average of 3.24 and they have given up 370 base hits on the year. Teams are hitting .226 against the Red Sox bullpen. Their relievers have struck out 464 batters and walked 148 opposing hitters. As a team, Boston allows 8.5 hits per nine innings while striking out 9.5 batters per nine innings. They are 4th in the league in team earned run average at 3.73. The Red Sox pitchers as a team have surrendered 1,201 base knocks and 528 earned runs this season. They have given up 168 home runs this year, which ranks 20th in Major League Baseball. Boston as a staff has walked 391 hitters and struck out 1,343 batters. They give up a walk 2.8 times per 9 innings while they strike out 9.5 per 9. Their team WHIP is 1.25 while their FIP as a staff is 3.76. As a team, they are batting .258, good for 11th in the league. The Red Sox hold a .406 team slugging percentage and an on-base percentage of .331, which is good for 11th in baseball. They rank 7th in MLB with 9.0 hits per contest. Mookie Betts comes into this matchup batting .262 with an OBP of .341. He has 146 hits this year along with 78 RBI in 558 AB's. He maintains a slugging percentage of .434 with an OPS+ of 102. Xander Bogaerts is hitting .268 this season and he has an OBP of .331. He has collected 131 hits in 489 at bats while driving in 53 runs. He has an OPS+ of 91 and a slugging percentage of .399. The Red Sox as a unit have 1,261 base hits, including 253 doubles and 146 homers. Boston has walked 501 times this year and they have struck out on 1,047 occasions. They have had 999 men left on base and have an OPS of .738. They have scored 4.73 runs per game and totaled 662 runs this season. Who will win tonight's Rays/Red Sox MLB game against the spread?